Instagram, the social media photo-sharing app, is where I’m posting all of my studio work quite in-depth lately. My new Upcycled Brooch No. 1 and its Adobe Illustrator drawings occupy at least six of my last Instagram posts. While I am far from any kind of “blogging star” – I can’t help but make a fun play on that fabulous 1980s, MTV-generation theme-song, “Video Killed the Radio Star” by the English new wave group, The Buggles. This year marks my fifth anniversary blogging on WordPress as “artdoesmatter”, and it’s been wonderful to watch many other blogging-artists and writers (who started their blogs also in 2012) parlay their most up-to-the-minute happenings between both the WordPress and Instagram platforms. 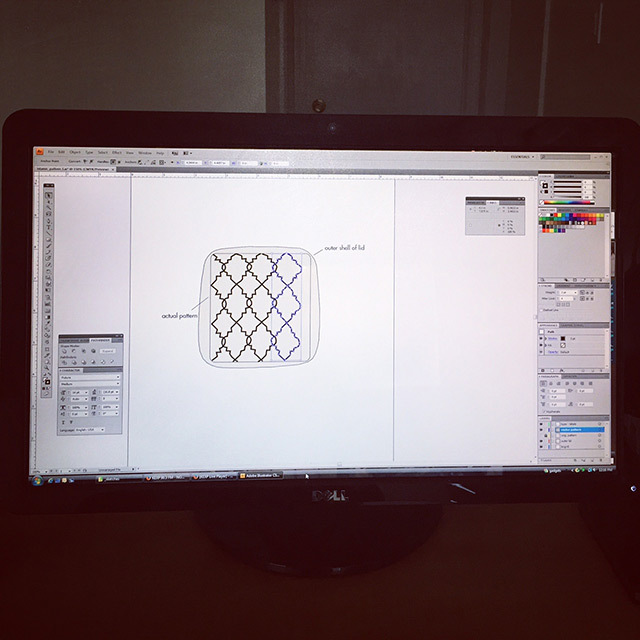 To give you a further idea of how my studio ideas begin and transform into a finished piece, on left is a photo of how things in my studio begin: at the computer using Adobe Illustrator software. Using the pen tool in Illustrator, I layout a rough idea of the pattern I’d like at a very enlarged scale. This is considered “freehand drawing” – even though many anti-digital purists would bicker at my use of the term freehand. But as I often point out to other Instagram commenters, I am the one operating the tool and moving it across the onscreen canvas with pixel ink that ultimately becomes a tangible, ink jet printout onto recycled paper or archival paper. In this image on left, I’m highlighting a part of the drawn pattern with the selection tool as I decide how I’m going to scale/size the final brooch piece. Next step, I print out my progress and compare the scale to what I feel would best complement a successful brooch piece. The beauty of working in software is that one can readily re-size or re-scale anything that is drawn in vector format; the entire basis of the Illustrator platform is vector, meaning the basic nucleus of the drawing is comprised of line and points along a path. The ivory-shaded border or frame on the print-out to the right of this photo represents the upcycled soup bowl lid that I’ll saw out and use as the outer frame of the completed brooch. 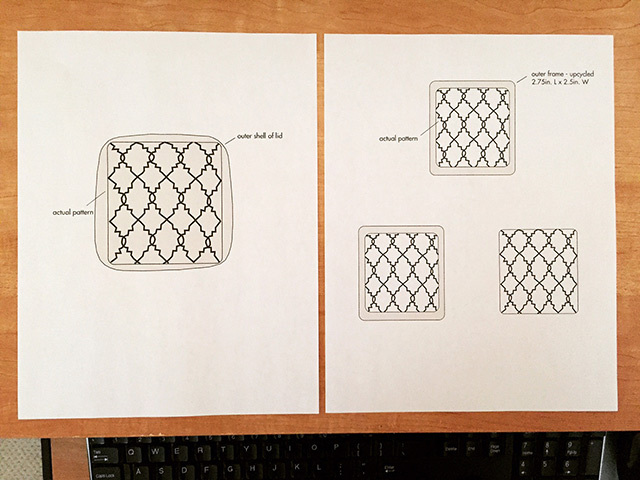 Using my jeweler’s sawframe, I saw out the microwave soup bowl material into the desired shape, utilizing the paper templates I create in Illustrator. 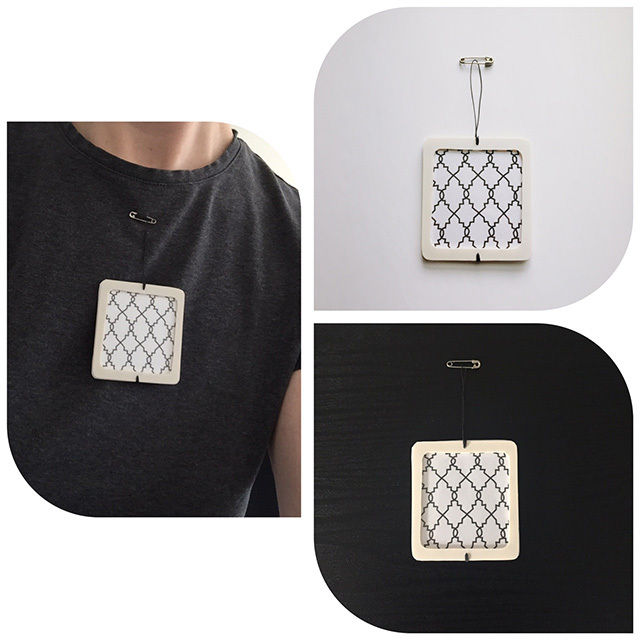 The split-screen on far left is how I cut the Plexiglas part of this brooch that frames the final ink jet print in place (just like a small painting may use plexi or glass in front of it!) Even though this piece doesn’t use any traditional metal (apart from the vintage safety pin the final piece employs) the identical tools one uses in the fabrication of small metals or jewelry are all used here. This includes the jeweler’s sawframe, sawblades, needle files, drill bits, drill and sawblade lube/wax. It’s the perfect process combination or amalgam of digital meets the handmade. 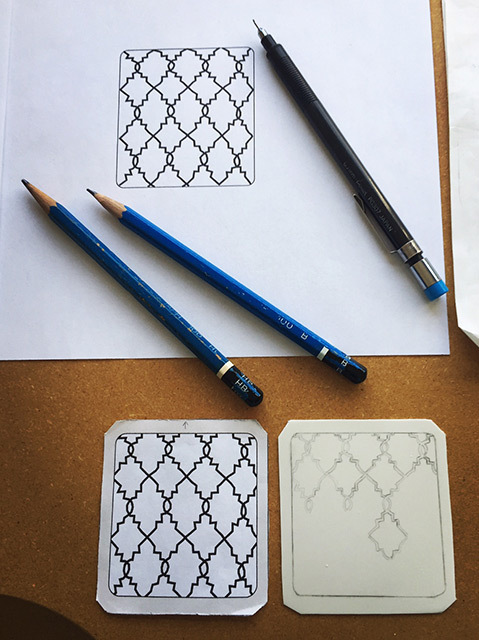 This pattern that I created is derived from historic textile patterns, used in Islamic decorative arts to Renaissance European scroll pattern work found on furniture mouldings or rugs. It was so enjoyable to use that I decided to draw it out manually – a traditional, freehand pencil drawing with graphite pencils on another piece of found soup bowl material that otherwise would have been discarded. Here it’s seen as a work-in-progress drawing. Eventually, I placed the finished graphite piece into a 5 inch-square black wood frame that complements the piece nicely. I encourage you to stop by my Instagram profile, known as artdoesmatter12 to see the final framed 2-D graphite drawing. All creative concepts and photographs used here are copyright Patricia Sullivan, and may not be used or re-published without written consent from the artist. Hi, Patricia. I loved reading this article because pretty much everything you write about are things I’m totally unfamiliar with. Adobe Illustrator, jewelry-making tools et al. You explained everything really well. And I like your design pattern a lot. Neil, I was very reluctant to write any post w/ such a large amount of shop talk, like pen tools or paths in Illustrator – or re: the jewelry making tools. In 5 years of blogging, I’ve only done this twice! And the other time was about chainmaking! (like for necklaces.) I’m glad all of this didn’t get too boring or dissuade you from reading! As always, it’s bloggers like you that inspire me to continue working. Hope both you and Sandra have a fantastic Spring. 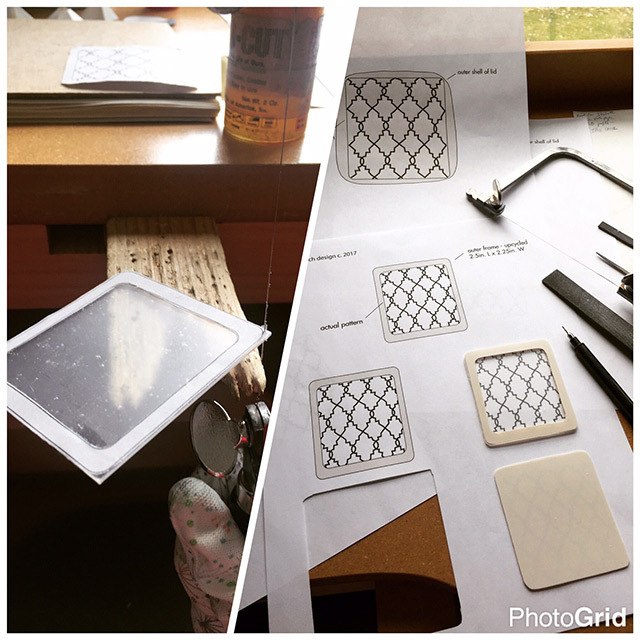 Love the description of the process Patricia, and how you have combined traditional tools with alternative materials! Happy anniversary! Thanks so much, Dawn – and you have been along for the ride w/ me with your wonderful ceramic art and poetry blogs. I always love the commentary and feedback you share w/ me on all social media. Have a great weekend! You write about your process very well! I’m glad you mentioned something about the textile pattern. Does that design mean anything else to you? I am “feeling” a tension in this piece and I am trying to figure out why and it may have to do with the high tech juxtaposition of using your computer and all it’s power with something as mundane as using a safety pin for a clasp along with the recycled soup bowl. With my own work, I have posted way more of late on Facebook. Have been rather disappointed with the blogging world for the past year even when linked to other social media venues. I know more people find me through Google searches. I know that’s not realistic anymore considering the millions of WordPress users out there. I think part of it has to do with people not wanting to read very much. Al, you’ve given me so much to think about here! I can say while it may not have been a conscious decision – there is tension present in that pattern. It may just be all those interlocking lines and points. And yes – I can’t believe you nearly read my mind as to my thoughts re: the blogging world of late and its link to social media. It seems that each generation that embraces its “technology of the day” resorts to more picture-oriented stimuli. Therefore, the popularity of Instagram being a photo-only app, eliminates the reading aspect – the part we bloggers adore the most: the narrative. I hate to blame the new millennial generation, but I’m seeing that most do not have any interest in pursuing the best part about writing about artwork: the verbal interaction w/ others. It’s all about the photos to them. Thanks so much for stopping by – I always love how much your comments make me think and get me “cooking” on future ideas!! I have had this conversation many times before. What I try not to do is blame young people for using the tools we have given them. What I am critical about however is a the general lack of knowledge and by extension the lack of what I recognize as passion or just plain interest where if you don’t know something…you try to find out. That’s what these great new tools were meant to be used for. I have met many young artists that don’t know the history of their chosen media much less something about art as a human proclivity. Even the very vocabulary of art is disappearing and I see that with sculptors in particular. It’s becoming rarer to hear a sculpture described in terms of mass, volume, movement, or scale. Just to return to blogging for a moment…it seems many successful blogs are not built on original content. It’s a lot of stuff that’s rarely interesting that simply gets”shared”. I try to take a little personal pride in the words I string together to go with the pictures and to say it all in such a way that it is not only mine, but touches on the universal as well. Al, all so well said. I do agree that history of a particular art form or media (such as sculpture) is not something that generates any interest w/ young folks. They are overly concerned w/ “not offending” anyone – what happened to the era of artists as activists? Sure, there are new calls for artwork I see about artwork based on current political/social issues. Then the work that I see getting submitted/accepted is all this abstracted material (junk?!) that doesn’t address any pointed issue at all. And your comments re: the transition of late in the blogging world are dead-on true. Why is so much material just getting “shared”? With no new original content or even new remarks added? I can’t thank you enough for dropping by and getting this discussion going here. I could do hours on these topics!!! Me too. Could talk about this all day long, but there is work to do and art to be made. Thank you for engaging in some dialogue with me. One last thing…isn’t this what we were hoping blogging would be about? Wow, has is already been 5 years? Amazing. Patricia, I am so happy to read another one of your posts (I can only manage Facebook, and rarely check Instagram so, sadly, I have missed your posts there). Yes, I know, we are visual people and love pictures, but I think blogs are the best. I enjoy reading blog posts in general – and yours in particular – it’s a great way to show in details and in depth a creative process, techniques, concepts, etc. and to exchange ideas as well of course. Thank you for doing just that! I am not much of an expert when it comes to anything digital, it often feels quite dry to me, but I love how you describe your process, in a way that I can actually understand, user-friendly and lively. The way you use upcycled materials, the combination of digital and “analog” techniques is quite original and creative. It all comes together so well. Thanks, Patricia, for a very inspiring post. Dominique, your lovely comments here completely made my morning! I want to say how much I’ve enjoyed reading your feedback on “artdoesmatter” since my earliest posts in 2012. You’ve always “been here” for me! And I will never take that for granted. I’m relieved to hear that this post with all its digital vs. “analog” styles of jewelry making did not get trudged down in tech talk. While I have spent time posting weekly studio shots to Instagram, I deep-down will always prefer the blog combination of narrative writing with photos/illustrations. It just seems more natural than posting any one-off photos w/ a “drive-by” caption. Thank you for spending time, reading my thoughts and giving me the feedback that I don’t get usually, sitting in the studio with only a computer and a workbench. Hope you’re having a great Spring and enjoying the gorgeous B.C. weather. Thanks, Patricia! Yes, Spring has finally come to the West Coast, and the cherry trees are in full gorgeous bloom. This makes up for the long winter we had. I hope you are having a beautiful Spring too. Hi, Patricia. I do hope that Instagram doesn’t kill blogging. I know so many bloggers who have dropped by the wayside in favor of Facebook and Instagram but blogging is so much more, in my opinion. I do post to FB often but not IG. I can’t stand to think of yet another place where I need to upload. I do have an IG account, though, so I’ll check you out there. And I envy you seeing a Pileated Woodpecker so much, they are very dramatic-looking. We don’t have them here although they do in CA so hopefully one will cross my path sometime there or in the midwest. Candace, TY soo much for going that extra mile and following me over on Instagram – I just followed you back. I agree – the amount of social media sites we artist- bloggers maintain is getting a tad ridiculous!! Your Glenrosa Journeys blog is one of the most beautifully photographed and well-written blogs I’ve encountered, so I’d hate to ever see it disappear over FB/Insta. I know I’m a “detail freak” and I just can’t get that level of narrative details about my work in a photo. Even the multi-grid photos I love to use on IG!! I know you’d love my pileated woodpecker guy that visits about once per day – but we have a male “hairy woodpecker” that is a hungry little fella, and he’s at my suet feeder constantly!! I’m so enjoying my recent backyard bird watching antics; but my photography is so lacking. Your photographs are amazing! Thanks so much for dropping by and commenting. Thank you so much for the compliments, Patricia.